Leah's Crafty Life: I got you now Day 2 with SOG! I got you now Day 2 with SOG! Welcome back friends and happy Tuesday! This is my absolute FAVORITE release from Some Odd Girl this week.. don't get me wrong, I adore them all, but these two remind me of my littles, Samantha & Cameron. Meet Tia & Tobie enjoying some fun in the sun.. nothing goes better than having some Water Fun! I just had to create a easel card with these two. The card base was cut using my Cameo, I love the half circles that hold up the top of the card. Cameron loved this card too, because he selected it to give to his best friend at his birthday party last week. We ended up stamping Happy Birthday in the middle at the bottom, and we wrote a little note on the inside. 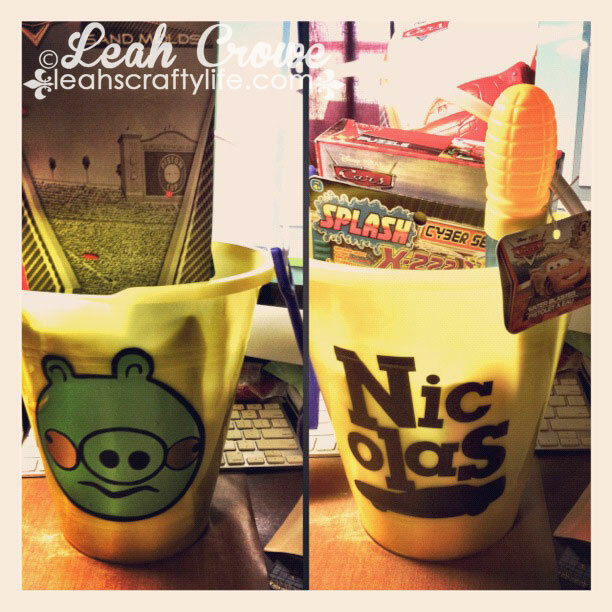 Everyone loved the card and the gift we made.. we customized his birthday bucket with Vinyl and filled it with fun summer toys. anyways.. check out all the awesome creations on the Odd Girl Blog with Tia & Tobie!! Big water fun in the sun hugs to you! WOW! Your coloring on this is amazing! Gorgeous card! Fabulous idea with the half circles proping up the card!! I have never seen anyone do that before, super idea! These two are so fun! You gave them a wonderful background! Awesome job! Wow Leah, this is awesome! I just love this card and your colouring is fabulous! What a great gift idea too! This this is very adorable I really love this card. How fun! Reminds me of my kiddos!! Super cute card! This is so cute and fun! What an adorable card.. your colors and coloring is amazing! Thanks so much for stopping by the TAWS Blog Hop! :) Don't forget to come back tomorrow for more Sneak Peeks..
omgosh, this is so cute (was one of my fav images from the released, too) and I love that you used the cameo to cut your base!!! Ohhhhhhhhhh how ADORABLE is that stamp!?!?!?!?!? I loveeeeeeeeeeeee it!!!!!! amazing amazing stamp i adore that stamp i am going to add it to my wishlist! !love the easel card! Lets go fly a kite, erm, or ride a bike!! Clear Scraps & Stampendous Blog hop!! Let's get dirty with Mae! Have a fairy sweet day! Color challenge with Some Odd Girl!